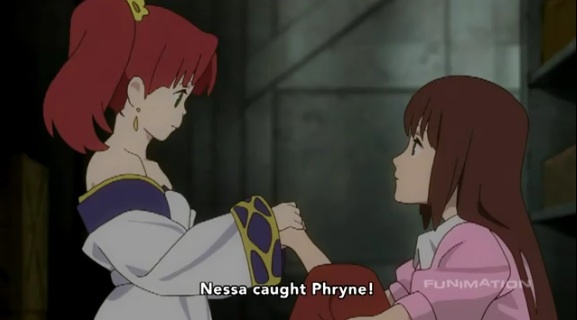 After Clain and Phryne were abducted, the terrorist airship started having a problem in the air because Nessa (a dopple of Phryne’s little sister) was hiding somewhere in the ship, and that caused the system to malfunction. 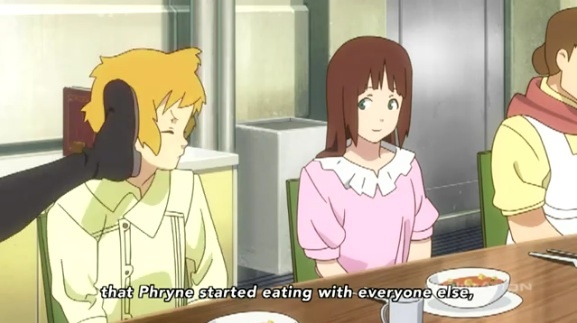 The reason why she disappeared was because she was mad at Clain for caring about Phryne more than her. Her melancholy created a problem in a way like Haruhi did. 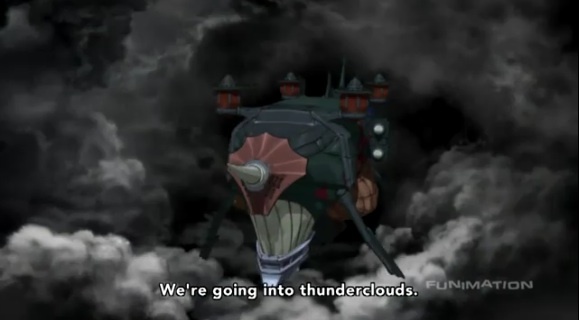 And then, the airship was lost in the thunderstorm. 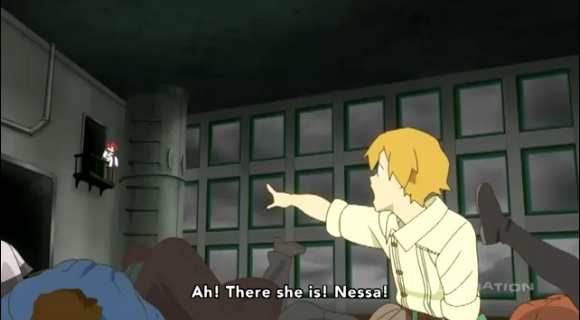 It was urgent to find Nessa to save the ship from crashing. So, Clain suggested them to dance, because Nessa loved dancing. So, they started dancing. 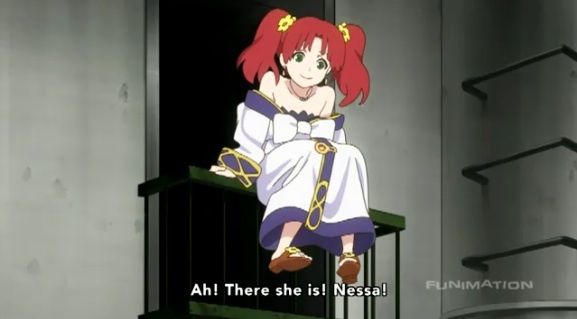 And after a while, Nessa finally appeared and became cheerful again. 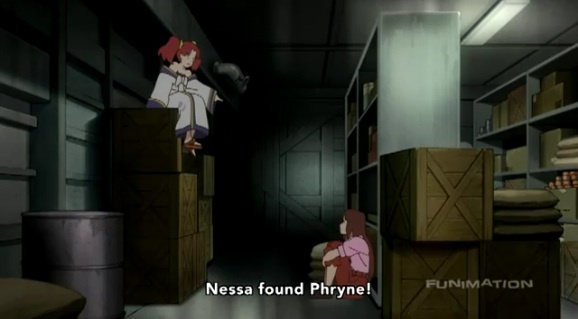 And eventually Nessa went to look for Phryne, and found her. And the airship was stabilized. Somehow, this episode reminds me of the Iwato-gakure legend from Japan. Amaterasu, the supreme Sun Goddess, hid behind the rock because her little brother played prank at her workshop. Then, the world went dark, and the gods panicked. So, Uzume volunteered to strip-dance, causing laughter among the gods. Then, curious Amaterasu peeked out and came out again, and the light went back to the world. 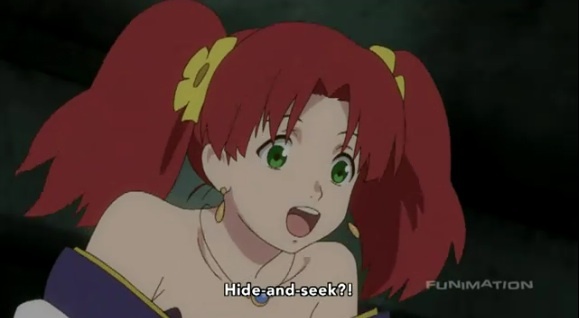 So, basically the theme of this episode was Hide-and-seek. Nessa was it, playing fort/da, Inai-inai-bā (it isn’t here, isn’t here, here it is!). And the word “it” is “oni (goblin)” in Japanese. “Il y a” in French. And oni must touch a chasee in order to quit being oni. Yes, touching, skinship indeed. Peekaboo is usually played with infants. But peekaboo is also played by grownup girls, especially nubile girls! It’s been recorded that if a girl sees her potential mate at a restaurant, she hides her face behind a menu book, and peeks at him, and giggles. Girls during the Victorian period used a hand-held fan to do that. Yes, fort/da is a foreplay to skinship. Just like St. Peter got the Keys of Heaven, peekaboo is a Key To Skinship. How awesome is peekaboo… So I’ve been hiding behind my DS, yet has anybody sought me? Bother to even dance and flirt? So, I’m always fort, left in the dark. So, I play fort/da by myself since there’s no da, no light in 3-D. Who’d say “Da!” like Antonio Inoki? So, I want Nessa to exclaim, “1, 2, 3, da! 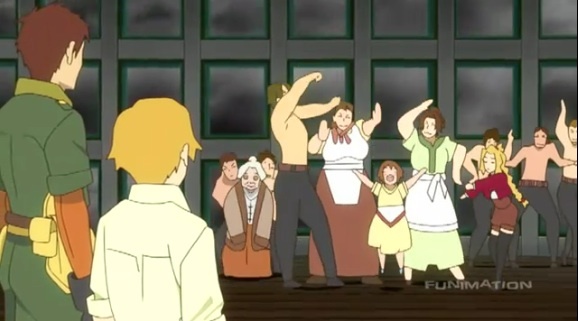 Il y a LaMoe!” Or should I go to a maid-café and request “1, 2, 3, da!“? The eyes of contempt, I want to hide away from. We’ve had enough of Search and Destroy instead of Hide-and-seek. Cops and soldiers wear a helmet and shades to remain faceless, like that Goya’s painting. Just like dullahan, Celty from Durarara! But the eyes of appraisal, I want to get exposed to. That will surely make me narcissist, instead of being a self-loathing meek. 2-D or not 2-D, that is the question. By the way the collection of shirts from sheldon are very desirable, at least to me, specially the old ones. Thank you very much for the comment. That’s awesome about the Sheldon shirts. I totally admire that. I haven’t watched Big Bang Theory. I don’t know if this show will trickle down to otaku/hikikomori/NEET. Oh, yes, I should have pointed out Densha Otoko too.